With the name of Bushnell being associated with making quality and high performing laser golf rangefinders, one can be sure that this one would satisfy the same expectations or would exceed it. 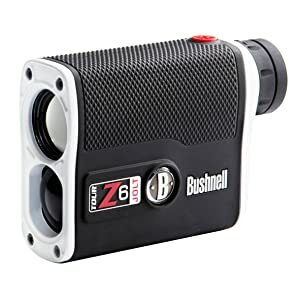 The Bushnell Tour Z6 Golf Laser Rangefinder with Jolt is much compact, more powerful and is equipped with technical advancements that make this device more accurate and quick in giving results during play. Let us find more details on features and specifications of this excellent golf rangefinder bellow. Why Bushnell Tour Z6 Golf Laser Rangefinder? 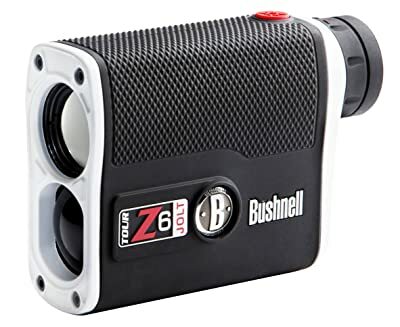 The Bushnell Tour Z6 Golf Laser Rangefinder serves to be the most premium choice for golfers because of its compact design and instantaneous accurate measurements. The new 2nd generation E.S.P. and Vivid Display Technology used with this device gives improved clarity, light transmission and contrast. The design is also quite user-friendly even in comparison to its Bushnell peers. Golfers can easily carry and store this rangefinder and it would work for them in all weather conditions as it is completely waterproof. Not only the device gives accurate results but also has a great feel of using it. The device is appointed with the award-winning PinSeeker with Jolt technology. Golfers can play doubt-free game with a target set exactly on its position with complete precision through use of this device. Golfers will be able to feel the exact position of the target with the jolt vibration technology. This golf rangefinder by Bushnell has a vertical style operation similar to the Bushnell Tour V3 Jolt Standard Edition. Moreover the design is quite compact and is user-friendly with rubber armored metal housing.This design of the rangefinder is tour certified and is completely water-resistant. The device comes with a premium carrying case that could easily fit in the hands of the golf player and thus during the play it is one of the most convenient devices to use. This premium device is appointed with VDT – Vivid Display Technology that counts for its enhanced contrast, light transmission and clarity. This optical improvement of technology also increases the clarity and brightness and thus user can easily read the digital information displayed in different lighting conditions. The product is surely a better and enhanced version of its earlier models. It has a similar warranty of 2 years that goes with other models of Bushnell. The measurements are 4.1 x 1.4 x 3 inches. Not only it is compact in design but also have a relatively light weight of 8.2 ounces which further eases its handling. The Bushnell Tour Z6 Golf Laser Rangefinder gives most precise measurements of flags for up to 450 yards. This information is measured and displayed with speed and covers an amazing range 5 to 1,300 yards. The device gives you accuracy to 1/2 yard from 5 to 125 yards. This device is termed to be one of the most advanced laser rangefinders because of its precise targeting with PinSeeker and Jolt Vibration Technology. It enables easy setting of target without capturing background objects. If more than two objects are captured the closer one is shown on the display screen. The Jolt technology gives a short vibration in order to inform user that the laser has locked on position of the flag. These technologies leave no question of uncertainty in target capturing. Apart from that the device features a 6 times magnification along with diopter setting (adjustable). You can be surer after zooming in your target and can carefully select your position accordingly. This rangefinder is capable of giving most accurate results with an extremely fast speed, thanks to the new Second Generation E.S.P. (Extreme Speed Precision) Technology appointed with this device. It doesn’t only give you a speedy results but with complete precision. You can get exact distance displayed to 1/10thof a yard and can play with confidence. With the use of PinSeeker, Jolt, E.S.P.2 and Vivid Display technologies, this device becomes the most accurate and easy to use golf rangefinder in a tournament. It is really simple to use and gives continuously updated display information. The measurement ranges are displayed in both meters and yards. Rubber armoring of this device makes it user-friendly. This device works well for beginners as well as for experts with clear display of details. The Bushnell Tour Z6 Golf Laser Rangefinder is powered with CR2 3 Volts battery that is included in the product. The Bushnell laser rangefinders have good battery life. Full reviews of the Bushnell Tour Z6 Golf Laser Rangefinder suggest that it has several advantages and only some disadvantages. This rangefinder uses PinSeeker with Jolt technology giving completely accurate results of targeting and distances. New 2nd Generation E.S.P. technology enables it work faster and with more accuracy as compared to other devices. Advanced Vivid Display Technology gives enhanced clarity under all conditions of lighting. It has impressive ranging performance of 5-1,300 yards and over 450 yards for flag. 6 times magnification gives more clear information. The device can be handled with single hand vertically. The rangefinder is compact and light weight. Premium carrying case for the device. 3 volts powerful battery included. Bushnell gives a 2 year worry-free warranty for their devices. This advanced rangefinder doesn’t have automatic scan mode as opposed to its earlier versions that limits your ability to pan across the targets. You need to press the fire button firmly for it to operate. It doesn’t calculate slope distance and limits golfers to only straight line distances. Our final verdict for the Bushnell Tour Z6 Golf Laser Rangefinder with Jolt reveals that it is one of the most technologically advanced laser rangefinder with PinSeeker, Vivid Display and 6 times magnification with a design easy to handle and accurate results. Not only it gives you exact targeting but it works extremely fast. Get it now to enjoy head-to-head features of other competitive products with an average price range.